Looking behind in the pipeline. 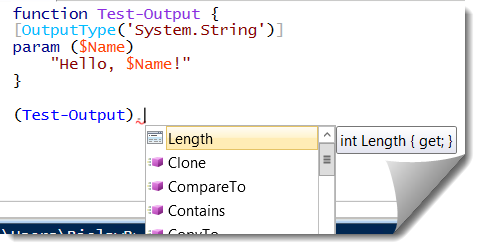 Have you ever wished that you could tab-complete things in pipeline? Wouldn’t it be great if PowerShell would actually recognize things that happen in previous step and give as clues based on that information? Well, in RC it actually works. And depends on OutputType defined by a given command. …would allow me to press [Tab] after N and get Name. Same applies also to simplified syntax and other –Object cmdlets. But wait, there’s more! … I could do the same. As you can see now you can save a lot of time during authoring your scripts and modules. There is only this small requirement – OutputType. My command has OutputType, and yours? So – with very little work I was able to simplify using my command and it’s results for anybody who will decide to do so. This entry was posted in PowerShell and tagged PowerShell ISE, Scripting Techniques, V3 by Bartek Bielawski. Bookmark the permalink. Anyone know how to define the OutputType of a simple .ps1 script? It will bring the same ItelliSense/ TabExpansion experience as it does for functions. This was a big help to me; thanks. 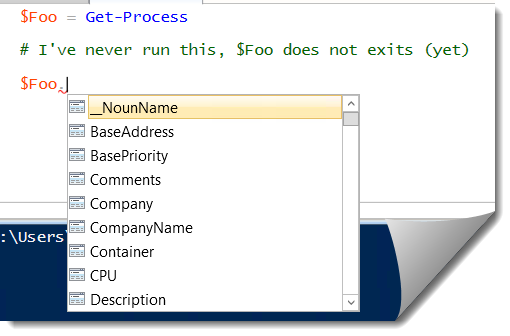 How would you implement this for different functions contained in a PowerShell module, where each function has different properties? OutputType is a command attribute, so each function in your module needs to define it separately. So even if your functions would share these – you need to copy&paste your code to each of them.